If reading from the image, please read the tweets from bottom to top; text version is below. Good afternoon. This is the last day of my ascetic practice. Only week, but it may have changed my viewpoint a bit for the rest of my life. I got a call from Mr. Chiba, CSO. We talked about Twitter and how we can best use it. I’ve decided to read, but not reply to, expressions of opinion and criticisms. When I receive helpful opinions from our customers and fans I will forward them to the right people in our company. They will address issues and respond if needed. We believe we should use Twitter effectively and in a friendly way. Many customers have very strong feelings about Tohoshinki and other artists. I’m not always the best person to answer them. Twitter isn’t always the best place for addressing concerns or making statements – some contracts have very strict non-disclosure language. For example, there may have not been enough explanation about JJY, but as a listed company we can freely release only limited information. We abstained from making contentious comments, even though there were some differences of opinion between the other party and ourselves. As CEO of avex I was blamed by the fans. It made me consider my responsibilities and I honestly felt that sometimes they were too much. That pressure caused some emotional Tweeting. But I do want the fans to be able to vent by telling me their anxious feelings or complaints. I’ll continue listen to all opinions and complaints, but I may use the blocking function for people who apparently attack me personally. I want this Twitter account to be fun and use it to receive valuable opinions from all of you. Thank you very much for your understanding. 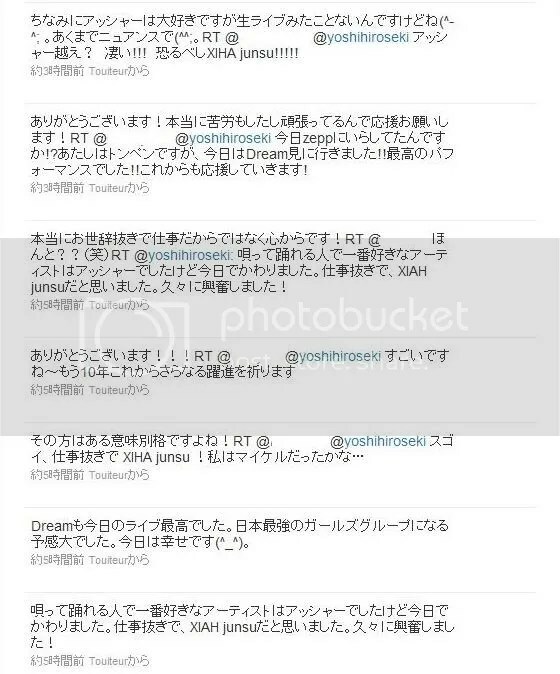 For JYJ fans who have seen those messages, they replied harsh messages like “I start to hate Japan.”, “JYJ is so pitiful”, “Bad guy” [this word is not very pleasant in Korean.] 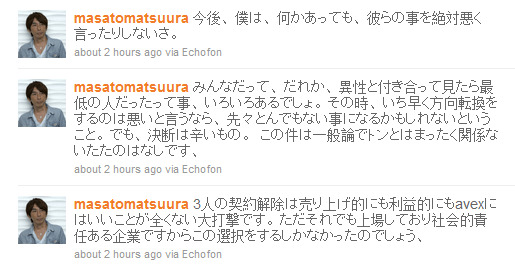 But masatomatsuura replied saying “You’ll get your retribution.” “Please be careful of what you say.” With that, a fight of resentment has started. masatomatsuura There are a lot of things I want to say. However, I will stop now. Although I’m sorry that among the Tohoshinki fans, there are people who feel displeased (t/n: precise meaning of the word is discomfort) with me, but can’t you please unfollow me? But of course, this is the individual’s freedom. 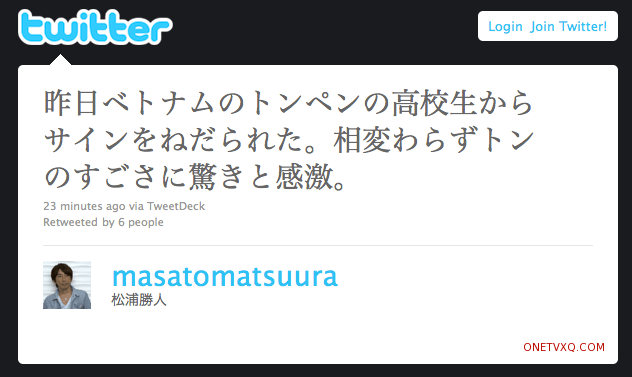 masatomatsuura From now on, for me, even if there’s anything, I will definitely not speak ill about them. masatomatsuura Everyone, anyone, you’ve had the experience where you date someone and they turned out to be the worst, right? At that time, when you find out, if you said that it is wrong to swiftly change courses, then in the inevitable future, it might become something worse. However, making the decision is difficult. For this matter, I’m just talking about a general opinion and has nothing to do with Tohoshinki. 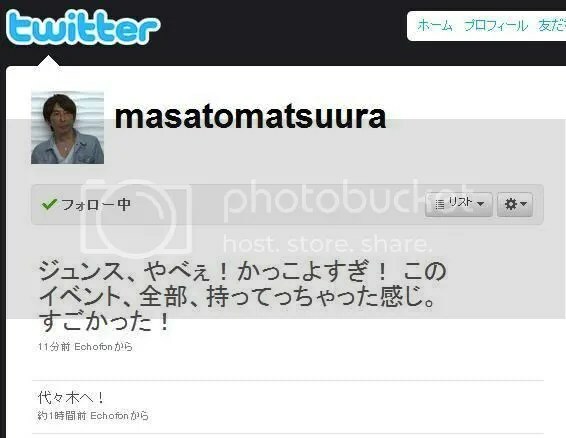 masatomatsuura The termination of the trio’s contracts does no good for the profit of sales and is a big blow to avex. However, as a socially responsible company listed on the stock exchange, this was the only choice we could make. Trans: Junsu, hot stuff! Super cool! He completely took off the total event. Amazing! Q: Did you say that he is now more than Usher? Heavens!!! 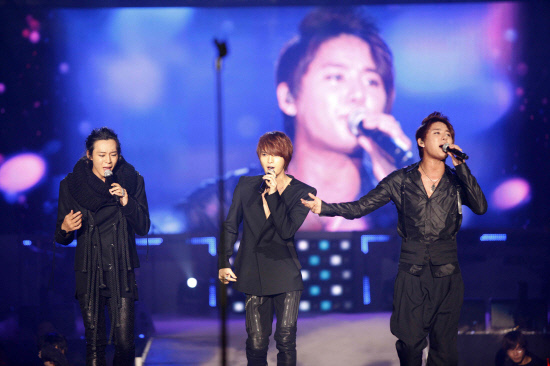 Great XIAH Junsu!!!!! Q: Did you go to zepp today!? I am a Tohoshinki fan, but today I went to watch DRM’s performance !! Their performance was beyond words!! I will support DRM in the future! A: Thank you very much! They have undergone many difficulties, so please support them! Q: Concerning your comment “My favorite artists, who can both sing and dance was Usher, but today, it changed. Apart from business, my favorite is now XIAH Junsu. Got excited after a long time.” Is it true? A: Yes, its true. No flattery, not because it is my business, but from the bottom of my heart! A: That person is in a class by himself! My favorite artists, who can both sing and dance was Usher, but today, it changed. Apart from business, my favorite is now XIAH Junsu. Got excited after a long time. T/N: Seki is an corporate officer of AMG (a group company of avex), the Music Division Director, in charge of rhythm zone.